FCP gives a damn about the In and Out marks in your sequence, it’ll edit your Viewer’s In mark to the current cursor position, so you need to make sure you’re at the first frame of the clip you want to replace. 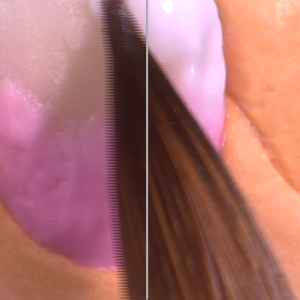 FCP doesn’t only replace the footage, it also replaces all your transformations and filters applied. If you just want to swap the material, you need to copy the clip before editing and paste the attrbutes (Option-V) after editing. Since the Editing Community will have to wait some more weeks for the release of the long awaited Final Cut X, I thought I’d share some insight of my latest work with Final Cut Pro 7. When importing footage from card media, it is possible to start editing with the imported clips while the others are still being ingested. However, I cannot say this is advisable. I encountered some random errors, such as clips only being partially transferred (with correct metadata, meaning FCP displays a duration of 3 seconds, and the clip (which should be 2 mins long) really is 3 secs. Other clips were fully imported, but with wrong metadata (you can shuttle through the entire clip of 2 mins, but FCP displays a duration of 5 secs in the browser window). So the old rule applies: Never touch a running system! Which is why you should ingest overnight, if you don’t have an assistant. When I realized that FCP screwed up during the ingest, the only thing I could do was to re-run the Log & Transfer for the corrupted clips. So I selected these in the browser window, right-clicked and chose “Make offline…”, then picking the “remove from disk” option. And this is where you should stop and check in the Finder if these files have been properly removed. In my cases, some were still on the disk, which resulted in a major hassle I’ll explain in the next section. Remember: Double-check if files you want to be removed really are removed. One sweet feature of FCP is the ability to rename files to match the clip name. However, if the file you’re trying to rename already exists, Final Cut won’t do it — without any prompt of the failed action. Here’s the story: I offlined the corrupted clips and ran the Log & Transfer again. Let’s say the clip (and file) name was “MVI_5612.mov”. What happens is when Final Cut detects a file of this name in the Capture Scratch folder, it automatically increases the index number to the next one available, like “MVI_5678.mov”, if files ranging from 5612 to 5677 have already been captured. But it displays “MVI_5612” in the browser window. Again, you can only rename file “MVI_5678.mov” to match its clip name (“MVI_5612”) if the file “MVI_5612.mov” does not exist in the same folder. Seems logical, but any decent piece of software would at least give you an obscure error message. Or crash with an exception. But I’m not getting into Avid here. Also known as the Media Mangler, it’s not advisable to use the Media Manager when you’re working with mixed footage. I had a project containing ProRes4444 FullHD 25p footage and DVCpro 720p50 footage. I had already figured out that there is no way to convert the 720p50 footage to 25fps without crushing the metadata (making re-capturing at a later time impossible, or at least very cumbersome), but the problem remains when you’re consolidating your project to get rid of unnecessary footage. Though all images match in the new project, edited audio gets totally mangled. My workaround for now is to render your audio coming from footage that is not in the timeline codec (in my case that’s all 720p50 audio because the timeline was ProRes4444) to a hard file. Make as many tracks as you need to have all padding for later edits, and then use the Media Manager to consolidate the project. Rarevision offers an alternative to Compressor and FCP’s Log and Transfer to convert Canon 5D footage that I couldn’t test myself up to now, but the images on their site looks very promising. This week I’ve been quite busy converting a series of videos into iPad-compatible format (which is h.264 video with AAC audio in an MP4 container), and I encountered an annoying glitch in Apple’s Compressor 3.5.x which is part of Final Cut Studio 3. It’s been reported that when working with interlaced footage, de-nterlacing and downscaling leads to bad results. My experience and the solution I’m giving here has worked with DVCpro 1080i50 material, I can’t say if it works for other formats as well. Here’s the thing: When deinterlacing, you have to leave the Deinterlace Filter off. Here are some screenshots to show the massive differences between Compressor’s Preview and the actual results. Once again, the source is 1080i, and I want the output to be 720p. The Image Processing settings are “better” for both Scaling and Deinterlacing, because “Optimum” takes ages to render. The output fields are set to “Progressive”. In Fig.1, the Deinterlace filter in the Filters Tab has been added with the “even” setting. As you can see, the result (right side) is promised to look very smooth. In Fig. 2 the Deinterlace filter is off, all other settings are the same. Notice the jagged edges and compression artifacts on the right side. But the results are just the other way round. In Fig. 3, which is the output from the processing with the filter enabled, the edges are all jagged and the whole image looks like a blow-up from one with half the resolution. But the file with the filter disabled (Fig. 4) looks all sweet. Oh, by the way, should you experience Compressor abort encoding with a “NewMovieFromFile failed” error when converting WMV with Flip4Mac 2.2.x, my current workaround is to export the WMV from QuicktimePlayer 7 with a ProRes 422 Setting and then use Compressor on the ProRes file to make whatever format. If you’re working with Final Cut Studio , you might have experienced some trouble with Compressor. For instance, after some time on one machine at my workplace you couldn’t transcode on the machine itself, only other machines available on the network (for insiders: the qmasterd service not launching story). Or in another case Compressor (or rather the Batch Monitor) kept aborting the transcode with strange Quicktime errors. In order to fix this, Apple put a Troubleshooting Guide online, but before you start try’n’error with it, I suggest you download Compressor Repair from Digital Rebellion, it really works wonders and fixed both of the problems I was talking about above without the hassle of a reinstall. Speaking of which I also recommend the FCS Remover app from the same company to get the software off your disk in the first place. Except that the whole feature had nothing else in common with The Blair Witch Project. Whenever there’s something in your product that’s a reference to another product, you really need to question hard if that reference will do any good, because people can easily distinguish between “same but different” and “same but better”. And they choose accordingly.